Bacon and chocolate are a new trend in gourmet chocolate bars, and now you can recreate this unlikely pairing at home! 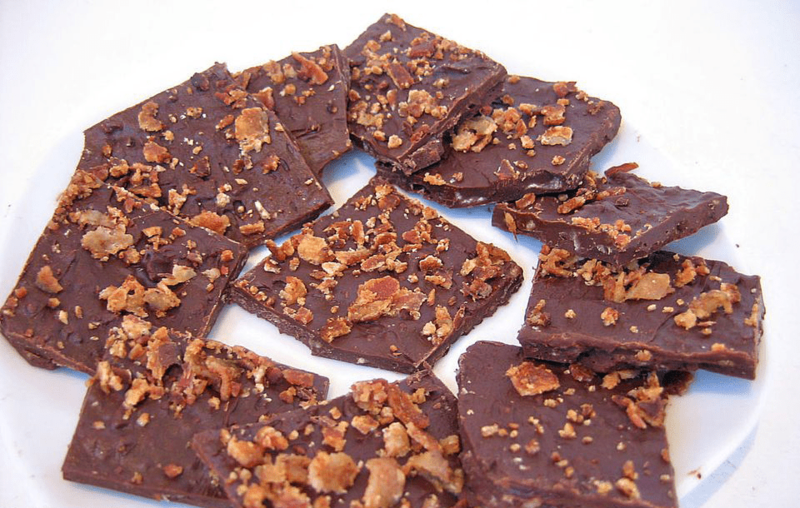 Semi-sweet chocolate is studded with chunks of crispy bacon and cut into small squares to make chocolate bacon bark. It is important that the bacon is fried until it is crispy because the crispy texture greatly improves the taste and texture of the final candy—soggy strips of bacon are pretty unappealing! While the chocolate is melting, chop the bacon strips into small bits. Set aside approximately one-third of the bacon to be used to top the bark. Once the chocolate is melted and smooth, stir in the remaining two-thirds of the chopped bacon, and stir until the bacon bits are well-incorporated. Pour the chocolate onto the prepared baking sheet, and with an offset spatula or a knife, spread it into a thin layer about 1/4” high. While the chocolate is still wet, sprinkle the top evenly with the reserved chopped bacon and press down gently to adhere it to the surface. Refrigerate the bacon bark to set the chocolate, about 30 minutes. Once set, break it into small uneven pieces by hand, and serve immediately. Chocolate bacon bark can be stored in an airtight container in the refrigerator for up to a week.